Martin Maiden, John Charles Smith et Adam Ledgeway (éd. 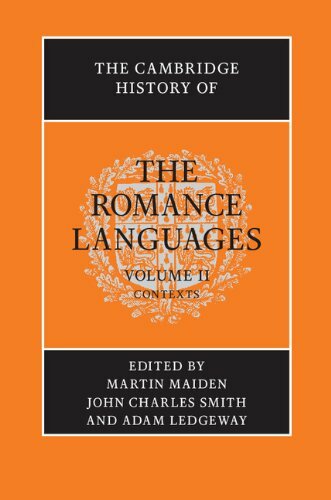 ), The Cambridge History of the Romance Languages. Volume 2, Contexts, Cambridge, 2013. Martin Maiden is Professor of the Romance Languages and Director of the Research Centre for Romance Linguistics at the University of Oxford, a Fellow of Trinity College, Oxford and a Fellow of the British Academy. John Charles Smith is Faculty Lecturer in French Linguistics and Deputy Director of the Research Centre for Romance Linguistics at the University of Oxford and a Fellow of St Catherine's College, Oxford. Adam Ledgeway is Senior Lecturer in Romance Philology at the University of Cambridge and a Fellow of Downing College, Cambridge.